When space probes first began taking closeup images of Mars in the early 1970s, the pictures revealed what appeared to be a long dead world. Ancient waterways were visible on the surface, but they had been dry for billions of years. Crater-topped volcanoes dotted the planet  some of them a mile or more higher than Everest  but they had stopped erupting eons ago. It all made a melancholy sort of sense: with only a tenth the mass of Earth, Mars has too little gravity to have held onto an atmosphere for very long, so any surface water would have escaped into space along with it. Its small size also let Mars' inner heat drain away relatively quickly, just as a newly baked bagel cools faster than a loaf of bread. Without that heat to drive volcanism, the planet would surely have gone seismically still. But what seems obvious isn't necessarily true. Over the past few years, satellites that now orbit the Red Planet continuously, and with far better instruments than those early probes, have picked up hints that Mars isn't quite dead after all. Cameras have found lava flows, for example, that date to only 2 million years in the past  last week in geological time  while sensors have detected whiffs of methane, a short-lived gas puffed out in volcanic eruptions. And now a team of British scientists have added one more link to the growing chain of evidence for a still active Mars. Using ultra-high-resolution images from the HiRISE, or High Resolution Imaging Science Experiment, camera aboard the Mars Reconnaissance Orbiter, they've found the telltale signs of a recent Marsquake in a region known as Cerberus Fossae, near the towering Elysium Mons volcano. The smoking gun, argues team leader Gerald Roberts, of the University of London: rolling boulders. The fact that we're even talking about something as small as boulders shows how far the technology has come. "These images are so good," says Roberts, whose analysis will appear Thursday in the Journal of Geophysical Research, Planets, "that we can see objects just a couple of meters [about 6 ft.] across for the first time." From the start, Cerberus Fossae had promise. Thanks to earlier images, Roberts and his team knew that the area has hardly any craters, indicating that it is a very young lava flow. They also knew that a fault cuts across the lava, so there was reason to believe a quake had indeed taken place not all that long ago. In science, however, "reason to believe" is not reason to be certain, so Roberts and his colleagues hit on the boulder idea as a way to confirm their suspicions. "On Earth," he says, "when an earthquake strikes, it often makes loose boulders roll, and the closer to the epicenter they are, the more they move." Armed with high-resolution images, Roberts and his team looked to see if the same had happened on Mars. They scrutinized something like a thousand boulders, he says, and sure enough, the evidence suggested that hundreds of them had moved. "The boulders left tracks in the dust showing that they'd rolled or even bounced down slopes," says Roberts. 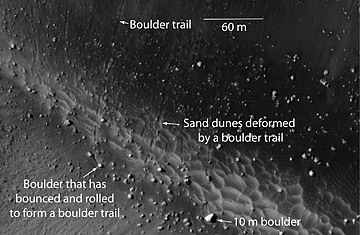 Admittedly, the rolling could have been caused by something other than a Marsquake  if boulders were frozen in place by a bit of subsurface ice, for example, which loosened when the heat from the noonday sun crept even a tiny bit above its typical peak of about 32°F (0°C). But if that happened, the pattern would have been random. Instead, the number of rolling rocks and the distance they traveled was highest right next to the fault and diminished the farther away the team looked. "The ice-melting hypothesis," Roberts says simply, "is not supported." So Mars hasn't quite expired completely  but there's no reason to believe any of the planet's volcanoes are ever going to erupt again. At most, this fault, as well as a number of others that radiate from the Elysium Mons, suggests that the volcano may simply be experiencing a few death rattles. Still, that means there's still a bit of underground heat, and that in turn, observes Roberts, implies that there could be some water  not ice  lurking not far below the surface. Since water is considered a basic requirement for life, the notion that Mars could have some sort of bacterial inhabitants, perhaps left over from the time when water flowed freely on the surface, becomes more plausible. As it happens, the original discovery of methane on Mars back in 2009 was interpreted by some as being direct evidence of Martian life: volcanic activity is one way the gas enters the atmosphere here on Earth, but bacteria churn methane as well. The new study by Roberts and crew suggests that the methane could end up being related to life after all  just in a more roundabout way.